Shirts, tunics, cottas - medieval tunics by Steel Mastery. In the sections “Shirts, tunics, cottas” you will find: medieval shirts, medieval tunics, medieval cottas, also known as knight`s tunic. This model of cotta was one on the most popular in the end of the XIV century - all social classes were used it. Only decorations and materials could be differ. Medieval cotta has tight fit sleeves, that are typical for this century, and also cuts till the upper-thigh on the sides. Lining of contrast colour will make your cotta more beautiful and comfortable. Long chausses and chemise will be a good addition to this cotta. We use only natural fabrics for sewing. To order this outfit in another material or colour, please contact us [email protected] Hat and chausses are not included to the price. Cotta is a classic type of medieval clothing, that is being worn over the undershirt - chemise. It was popular among all segments of people. Noble people used rich fabric and decoration. This model of long cotta has: - low V-shaped neckline; - decoration with fabric strip of contrast colour at neckline and the sleeves. Cotta goes perfectly together with short chausses and sleeveless gambeson. Lining makes cotta more comfortable. Different fabrics are available for order. Please choose colour of cotta in options, and send the wished colour of lining to us [email protected] Belt is not include in the price. Sleveless knee-lengh cotta is edged with a trim and fastened with buttons to the waist level. Together with shirt and pants, cotta can create especial character of fantasy-style warrior. You can order this model in any colour, made of linen/cotton/wool/silk/leather. The price does not include a belt. The short shirt is a part of costume of warrior, fantasy-styled character. It has round neck-hole with neckline, that is decorated with a trim. To make a complete character, you can combine the same-colour pants and sleeveless cotta together with this shirt. You can order this item in any colour, and is made of the next material: linen, cotton, wool, silk. The belt is not included to the price. This shirt is made of high-quality cotton, and is not only part of costume, but historically correct model of medieval shirt. Combined with short-sleeved cotta and pants with drawstrings, this shirt perfectly creates a dwarf character. It can be made not only of cotton, but of linen, silk or wool as well. Another colours of material are also available for order. Belt bag and boots are not included to the price. Tunic with long wide sleeves is perfect for creating a wizard character. This model is not only part of character, but is hictorically correct example of medieval tunic. It goes well together with long cloak with hood. Material and its colour can be changed upon your request. Belt beg is not included to the price of the wizard costume. This two-coloured cotta is decorated with lacing on the sides and with buttons. Elves are the most dainty race in fantasy world, and this semifitted cotta will perfectly accent this dainty of your character. Material and colours can be varied. The item is a part of fantasy-style costume "Elf" and is excellent with shirt and pants. The price does not include a belt with brass plates and belt-bag. Tunic is one of the main elements of the medieval costume and is worn mostly over the undershirt. This model is practical, comfortable and suitable for the implementation of the classic medieval image. Neckline and sleeves are decorated with contrast thread. Tunic is being made of only natural 100% fabric. Different colours are available for order. This model of shirt is made in typical European style of IX-XII centuries. It was a basic element in the traditional multilayered medieval costume. The neck and sleeves of this undershirt are decorated with the contrasting thread. The whole decoration is handmade. The chemise is being made of 100% natural fabrics: linen, cotton, wool, velvet or silk. Different colours are available for order. A good supplement for this shirt will be a tunic and a gambeson, chosen according to your wishes. Tunic in medieval Europe was always worn as the outer garment, so you'll never see a man is worn only the undershirt on the engravings (only the peasants). This tunic with sleeves up to the elbow is very comfortable and go well together with the undershirt. We can make this tunic of linen, cotton or wool in different colours. In medieval Europe the shirt was the main element of any man's costume. This model is characterized by democratic cut with a round neckline. Long sleeves and the neckline are bordered with a simple stripe on the edges. The shirt is being made of 100% natural fabrics: linen, cotton, wool, velvet or silk. Different colours are available for order. This shirt is presented in the classic colors. It can be worn as a separate item with a belt and without one and completed with a tunic or different gambeson. This is a popular model of shirt in Europe, which was worn directly on the body. It is the basis for correct historical medieval costume of VIII-XIII centuries. There is lacing on neck and sleeves, which allows you to fit this medieval underwear tightly. All holes for lacing are trimmed by hand. 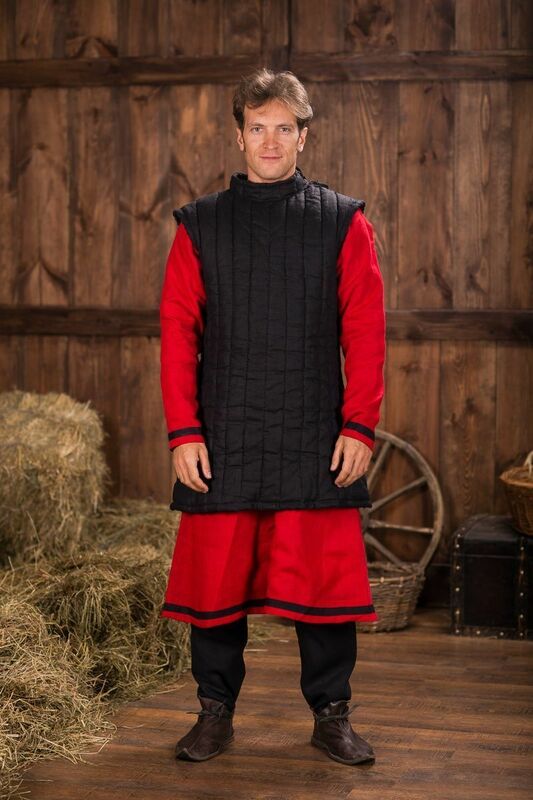 Medieval tunic and gambeson will make your character completed. The shirt is being made of 100% natural fabrics: linen, cotton, wool, velvet or silk. Different colours are available for order. Medieval sleveless tunic is very comfortable to be worn over an undershirt as well as underneath almost any armor. The tunic's neck is V-shaped that characterizes it like a tunic of IX-XII centuries classic style. It matches greatly the undershirt with lacing on sleeves and neck. Tunic is being made only of natural fabrics. Different colours are available for order. This tunic is a typical example of eastern tribes wearing starting from the II century a.d. It preserved its original appearance today in some national costumes of such eastern countries as Mongolia, Kazakhstan, etc. The tunic with round neck can be made of natural linen or cotton in different colours. Pants and Eastern gambeson will be perfect additions to this tunic. The price does not include the belt. Mens tunic is a traditional outfit, which was typical for medieval times, namely Medieval Europe VIII-XV centuries, and also fantasy-style models. We sew every item by hand according to individual parameters, personal regards of customer and medieval tunic patterns. You can order sca tunic, larp or fantasy tunic. If you need your tunic to be produced in ome other color, just give us a photo of it and we will find. If you have any difficulties during the choosing of model or options, please contact us. We will help you to specify your size and required model. If you didn’t find the wished piece of clothing in this section, we can make it individually for you. Just send picture with detailed description to [email protected] Then we will advise you price and discuss details of order. Starting the end of the 1st millennium, over the shirt men were wearing a tunic of thicker fabric. Most often such tunic had shorter sleeves, compared to the undershirt, or did not have them at all. Usually men were belting tunic with a belt or a simple rope, to which they could attach leather pouch, small bag or sheath. Thanks to crusaders, who were returning from East, in the XII-XIII centuries, shirts and tunics became not only more beautiful, but also fitted more comfortable. Neckline gained another cut, bottom edge and wristbands were being decorated with lacing. Besides, tailors started to add bright embroidery or trim on clothes. Cotta came in use in the middle of the XIII century. It had middle-thigh length or to the knee. For comfortable horse-riding, cottas had two cuts on the bottom edge – from the back and front, or on the the sides. Tailors used thick and firm fabric for such garment – cloth, cotton or wool. Colour of cotta usually was contrast and brighter, than colour of the undershirt. Neckline cut had lacing or strings for fastening. Also, such model of medieval clothing could be decorated with embroidery, trimming on sleeves and bottom hem, insets or applications of fabrics of contrast colours. Middle-class men were wearing upper dress of the cotta. It was called surcoat (French “sur cotte” – over the cotte). Usually, longer sleeves of contrast-coloured cotta were visible from under surcoat. Rich-decorated surcoat gained a great popularity in the end of the XIV century, especially at the European courts. Knights were wearing padded gambeson over the cotta, and only then – plate armour. Such multi-layered outfit (“onion rule”) was typical for all period of Middle Ages. It considered to be common and convenient to wear from three to six-seven elements of clothing on top of one another. Quantity of layers was showing financial and social state of owner.